Madhya Pradesh is the heart of northern India. Madhya Pradesh, India is a state located in central-northern India; for this reason, it’s often referred to as the "Heart of India". It's India’s second largest state in terms of area and, with nearly 75,000,000 people, it’s India’s sixth largest in terms of population. It's bordered by Uttar Pradesh to its northeast, Chhattisgarh to its southeast, Maharashtra to its south, Gujarat to its west and Rajasthan to its northwest. The state has a rich culture and is a hub for practically everything; it's also the watershed location for many rivers, which makes the state very important to India. Hindi is the primary language spoken here, but the languages of Gujarati, Marathi, Telugu, Bhilodi, Gondi, Korku, Kalto and about eight additional dialects of Hindi are also spoken. There are so many languages spoken here because of tribal influence, due to the fact that the state has always been a major trading hub and because of the many occupations over the state that occurred throughout history. Music and dance are extremely important Madhya Pradesh's culture. When it comes to music, classical and folk music reign. The state played a major role in the formation of classical music with Gwailor Gharana. Gharana comes from the Hindi word ghar, which means house or family and the word is used to identify where a style of music originated. Gwailor is the name of the town in Madhya Pradesh where this sytle came from. Most classical musicians can trace the style of their music back to the Gwailor sound. Famous classical singers, such as Miyan Tansen, came from the town of Gwailor and every year the Tansen Music Festival is celebrated at his tomb in Gwailor. Dhrupad is a popular classical singing style; its name comes from the words dhruva, meaning fixed, and pada, meaning words. This singing style also originated in the city of Gwailor. More than sixteen styles of folk music are still practiced in the state and more than 20 forms of folk dances are performed here too. Rivers, hills and highlands define the geography of the state. The Narmada River breaks the state into two sections; its northern part drains into the Ganges and its southern part drains into the Godavari and Mahanadi river systems. The Vindhyas Rivers make up the state’s boundary at the south of the Ganges, while the western part drains into the Yamuna. The eastern part of the Ganges basin consists of the Son, Tons and Rihand Rivers; this location is also where the state's Satpura and Vindhya Mountain Ranges are found. Plush forests are found in the southern region of the state, while those in the northwestern part of the state are more thorny. The Son River is important because it’s the largest tributary to the south bank of the Ganges that originates out of hills rather than the Himalayas. The state’s forests supply teak, bamboo and sal and rivers flowing eastward, southbound and westward around the state’s hills define the land layout of Madhya Pradesh. The state's recorded history began when its western city of Ujjain arose as a major urban trade area in sixth century BC. At that time, a kingdom, known as Malwa, ruled, while the eastern area was ruled by the Chedi Kingdom. In 320 BC, the powerful Maurya Empire arose and united the region under the rule of King Ashoka. Ashoka died in battle and central India was ruled by various ruling dynasties that fragmented the region once more. The city of Ujjain was important because it was an excellent trade location, due to its location between the Ganges Plain and the Arabian Sea. 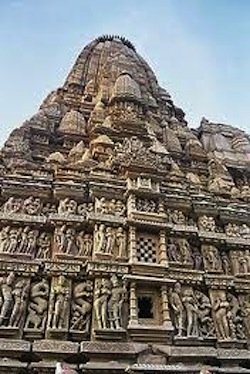 People passing through and inhabiting the area followed the religions of Hinduism and Buddhism; for this reason, Hinduism and Buddhism are the two primary religions of the state; Islam is also followed here. In the first few centuries AD, two dynasties known as the Satavahana and Saka fought for control of Madhya Pradesh. Subsequently, all of northern India was conquered by the Gupta empire, during India’s Classical Age in 4th and 5th century AD, but it collapsed at the end of the 5th century due to numerous attacks and eventual defeat from an invading group called the White Huns. As the state’s medieval history began in 528 AD, a king named Yasodharman defeated the Huns, but India remained fragmented, ruled by various kings and dynasties. Another king by the name of Harsha reunited northern India until 647 AD, when he was defeated. Essentially various Indian kingdoms and Afhgan invading kingdoms ruled the region for centuries; the Afghans were credited for bringing Islam to the region. The Afghans were taken out by a Hindu king named Hemu, when he attacked them in Agra and Dehli. However, in November of 1556, he died in India’s bloody Second Battle of Paniput, when most of the region fell under the control of a Mughal Emperor known as Akbar. The ruling Mugha Emperor Aurangzeb died in 1707 and a tribal Indian group called the Marathas began to expand and conquer land as Mughal control weakened. The Mughals and Marathas fought in the Third Battle of Panipt in 1761, which effectively prevented further Maratha expansion in the region. The state’s modern history began with the expansion of the British further into India. Three Anglo-Maratha wars were fought between 1775 and 1818 between the British and the organized Indian tribes; the third left the British in control over India and most states were allowed to be ruled by Indians as princely states, but remained under British control. 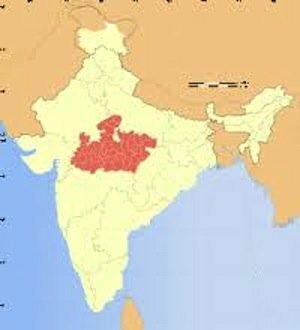 The British annexed the southeastern portion of Madya Pradesh in 1853, which became part the Central Provinces, along with the states of Maharashtra, Chhattisgarh and the Saugor and Nebudda territories. The rest of the state was governed by the Central India Agency. In 1950, after India gained its independence from Britain, the state lines began to form from the former British Central Provinces and portions of several Indian states and in 1956, the states of Madya Bharat, Vindhya Pradesh and Bhopal merged into parts of the state. Finally, today’s Madhya Pradesh was formed on November 1, 2000, which simultaneously created the modern state of Chhattisgarh. The state's economy was found to be weak when evaluated in 2008; its annual rate of growth was only 3.5%. According to the India State Hunger Index compiled by the International Food Policy Research Institute, the malnutrition evaluation in Madhya Pradesh is "extremely alarming"; it received a severity rating scoring between Ethiopia and Chad. The gross state domestic product for the state was better before Chhattisgarh was partitioned in 2004. After the partition, the new Madhya Pradesh produced about 70% of what it used to; the remainder was produced by Chhattisgarh. Madhya Pradesh is home to many of India's premier educational institutions such as the Indian Institute of Technology in Indore, Indian Institute of Information Technology, Indian Institute of Information Technology and Management, Madhav Institute of Technology and Science, Indian Institute of Management in Indore, Indian Institute of Forest Management, National Law Institute University, Maulana Azad National Institute of Technology and more! Are you thinking of traveling to India? If so, there are a lot of reasons to put Madhya Pradesh on your itinerary. It has numerous monuments, a large plateau, gorgeous mountain ranges, a collection of watershed river systems and many miles of dense forests that offer a unique collection of wildlife. Several cities in Madhya Pradesh are known for their gorgeous architecture and scenic beauty. Three World Heritage Sites have been designated in Madhya Pradesh; these are the Devi Jagadambi Temple, the Buddhist Monuments at Sanchi and the Rock Shelters of Bhimbetka. There are many other amazing sites to visit here too and because it is a large state, with a rich history, there is a lot to see and to discover. Leave Madhya Pradesh to visit the other states of Inda. Discover what it's lke in India today. Explore India from our homepage.